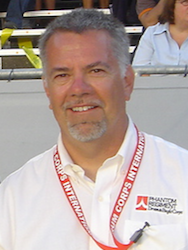 Tim Farrell was elected to the Phantom Regiment Board of Directors in July 1998 and has been on the board since. Previously, he served on the board from 1986-97. He has been president of the board since 2000 and previously was president from 1992-96. He is an account manager with United Displaycraft in Des Plaines, Ill., and its subsidiary, Interserve, Inc., in Belvidere, Ill. For more than 30 years, he was president of PG Display, a Rockford display manufacturing business founded by his father, Ken, who also served as president of Phantom Regiment for several years in the 1970s. Tim marched in the corps in 1972-75 as a member of the baritone section. He later was Phantom Regiment Cadets program coordinator in 1979-80 and a brass instructor with PRC in 1981-82. He has been on the board of directors of the Phantom Regiment Alumni Association since its founding in 1989. Prior to his terms as president of the PR board, he was development committee chair in 1989-91 and transportation committee chair in 1987-89. In 1996, Tim was honored with the organization’s Chevron Award for meritorious service and, in 2010, he had his name added to the alumni association’s Heritage Award. Tim was inducted into the Phantom Regiment Hall of Fame as part of the inaugural class in 2016. He was named Drum Corps International’s Volunteer of the Year in 2006. He is an avid motorsports fan as well as a bicyclist and motorcyclist. Tim, a lifelong Rockford resident, is married to Lisa, who marched French horn in Phantom Regiment in 1971-75. They have two children who both marched in the corps. Jessica was in the PRC color guard in 1994-99 and PR in 2000, while Stacey was in the baritone section of PRC in 1990-91 and PR in 1992-94.